Amitabh Bachchan, who was recently on a family holiday with wife Jaya Bachchan, daughter-in-law Aishwarya, granddaughter Aaradhya, daughter Shweta to celebrate son Abhishek's 40th birthday, shared a fresh picture. Amitabh Bachchan, who was recently on a family holiday with wife Jaya Bachchan, daughter-in-law Aishwarya, granddaughter Aaradhya, daughter Shweta to celebrate son Abhishek's 40th birthday, shared a fresh picture. The cute picture shows the ladies of the house posing on a bed by the pool side. 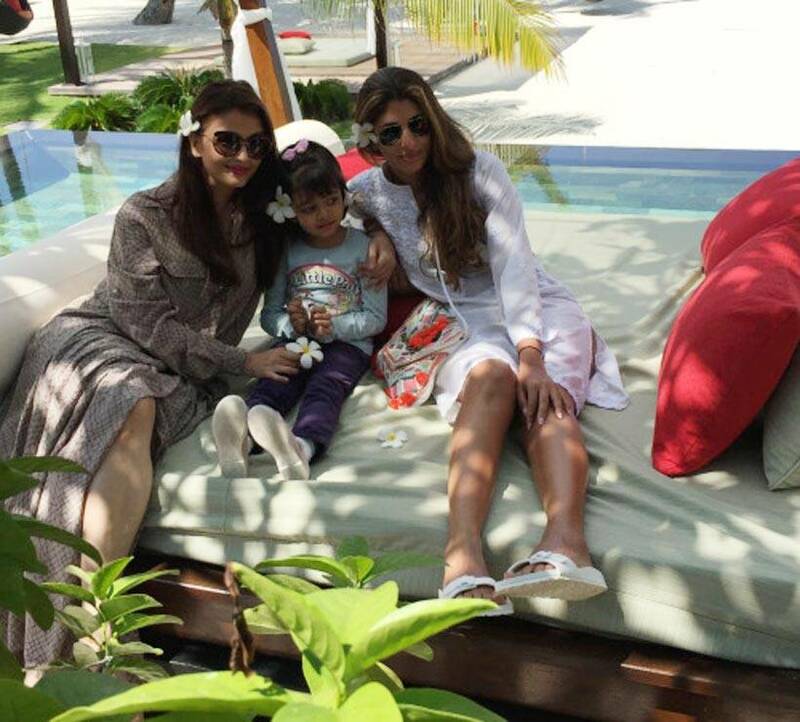 Aishwarya, Aaradhya, Shweta have flower accessory on their ears and trio look adorable. While Shweta is in white, Aishwarya is lovely in long dress and her daughter Aaradhya is smart in jeans and blue top. Sharing the picture on his blog, Big B had written a special note for the Bachchan girls: "Orchids are varied but rare and of some value .. to them that reach out to me such value is worthy of its presence .. But worthy are them that adorn my life .. my 3 beauties .. flowers on the right side of the hair dressing and all ..Ladies are special .. they always were and shall always be." 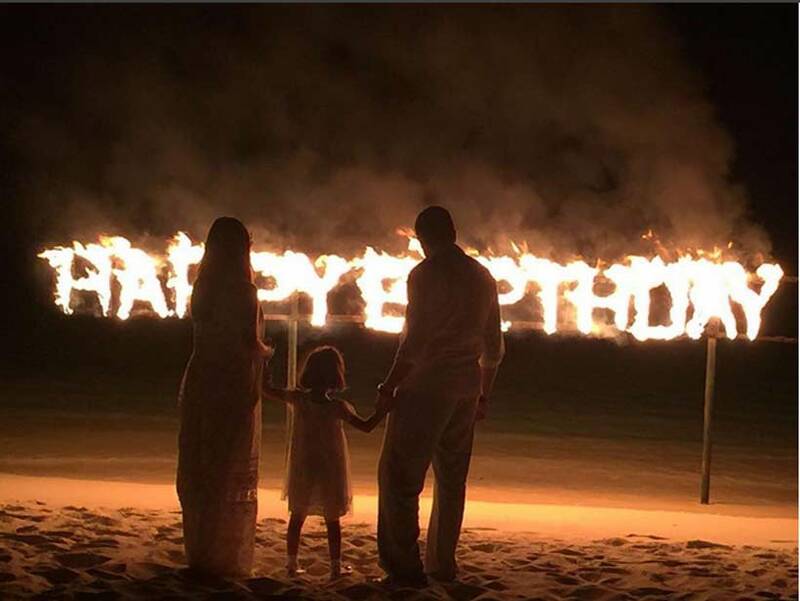 Aishwarya Rai Bachchan, her daughter Aaradhya celebrated Abhishek Bachchan's 40th birthday in Maldives recently. 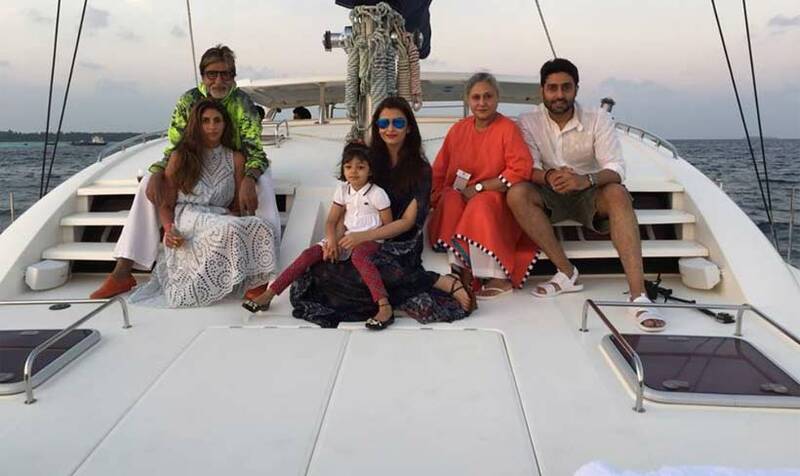 The entire Bachchan clan was in Maldives to usher in Abhishek's birthday. 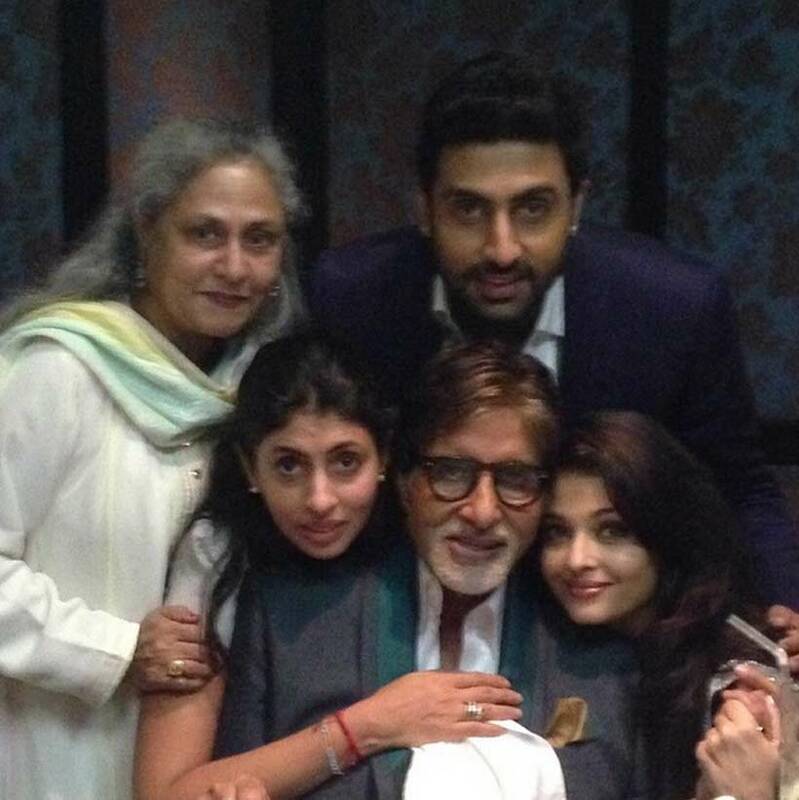 Abhishek shared the picture of his birthday celebrations with his family. He wrote: "Life is a journey which is far more enjoyable when your holding hands with the ones you love." Earlier, his father Amitabh Bachchan also posted a lovely picture of the Bachchan clan including Aishwarya Rai, granddaughter Aaradhya, wife Jaya, daughter Shweta on a yacth with birthday boy Abhishek. 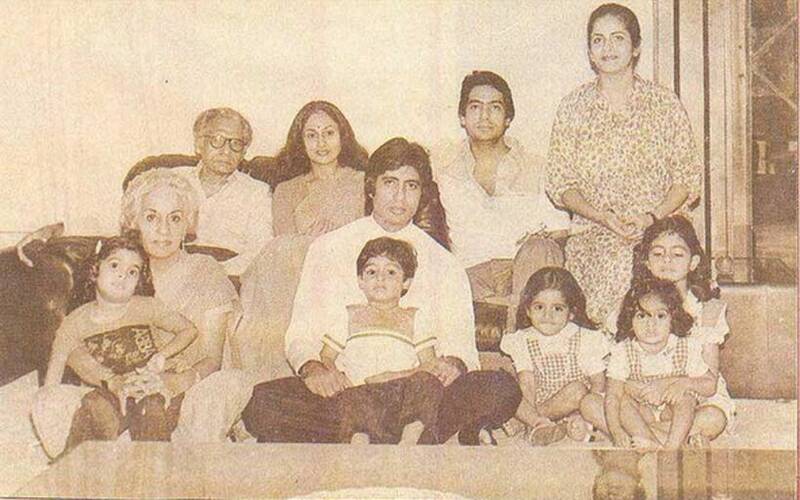 Sharing the picture on Facebook, Big B wrote: "The family that stays together .. sails together ..!!" 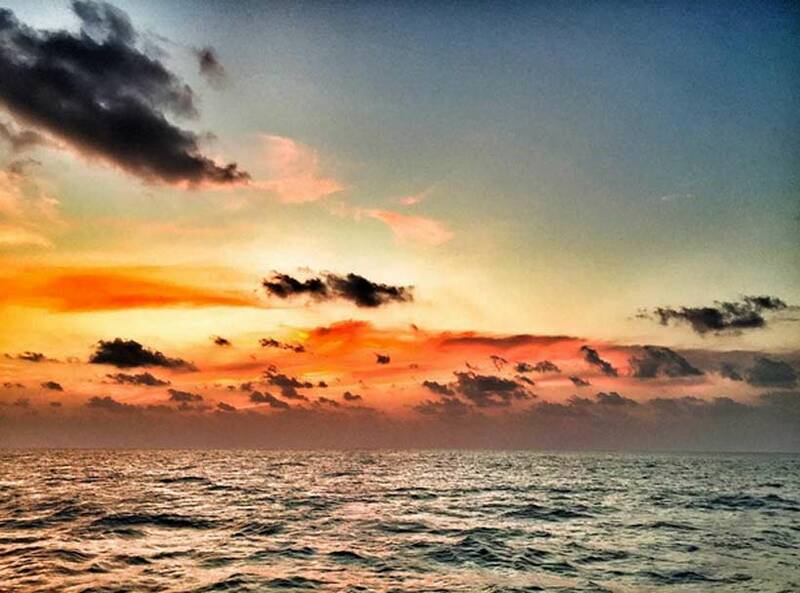 Abhishek, who is busy with his pro-kabbadi team, also shared a picture of the sunset. Amitabh Bachchan also shared a few pics from his holiday destination. 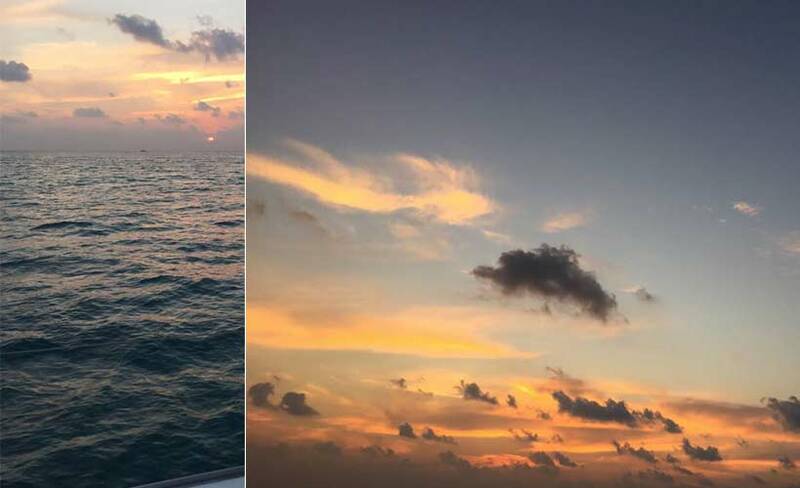 He wrote: "The silence of the water, the beauty of the sky and the Catamaran that gently floats away .. bliss"
Ahead a few pictures birthday Abhishek had shared on his Instagram. Abhishek celebrates his birthday with his friends every year but this time he decided to take his family on a trip abroad. Abhishek and Aishwarya got married in 2007. Together they have a four-year-old daughter Aaradhya. 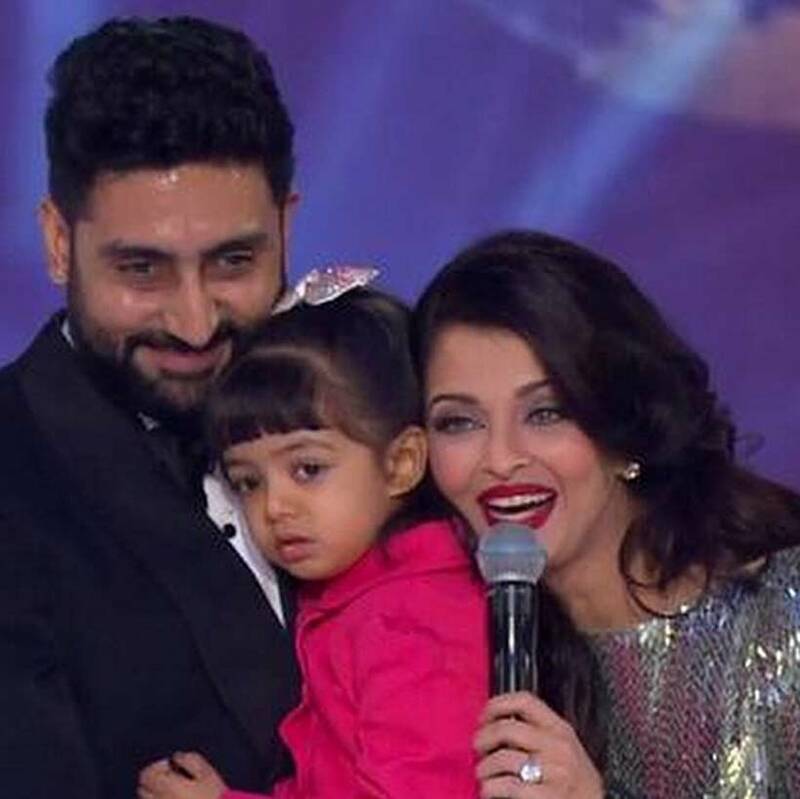 Seen here, Abhishek with Aishwarya and Aaradhya at Miss World event last year. Abhishek Bachchan with his wifey Aishwarya at a pro-kabaddia match. Aishwarya with daughter Aaradhya dressed as Pink Panther. Abhishek has a kabaddi team Jaipur Pink Panthers. Aishwarya and Abhishek had worked together in Dhai Akhshar Prem Ke, Sarkar Raj, Dhoom 2, kuch Na Kaho, Guru and Raavan. Seen here the couple in Chennai. Abhishek always accompanies his wife to the Cannes every year. Last year too he was seen supporting his wife Aishwarya at amfAR gala. Abhishek is also close his in-laws. 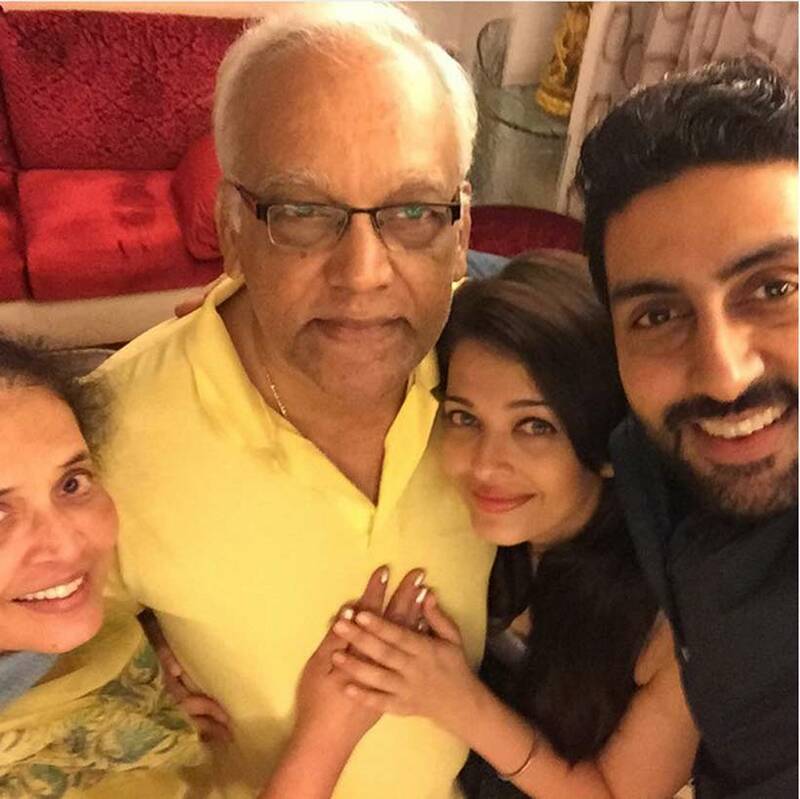 Seen here posing for a selfie with his father-in-law Krishna Raj, mother-in-law Vrinda and wifey Aishwarya. Abhishek Bachchan keeps sharing old pictures with his grandparents, in one such image young Abhishek sitting in his father's lap poses with his grand parents, uncle Ajitabh and parents. 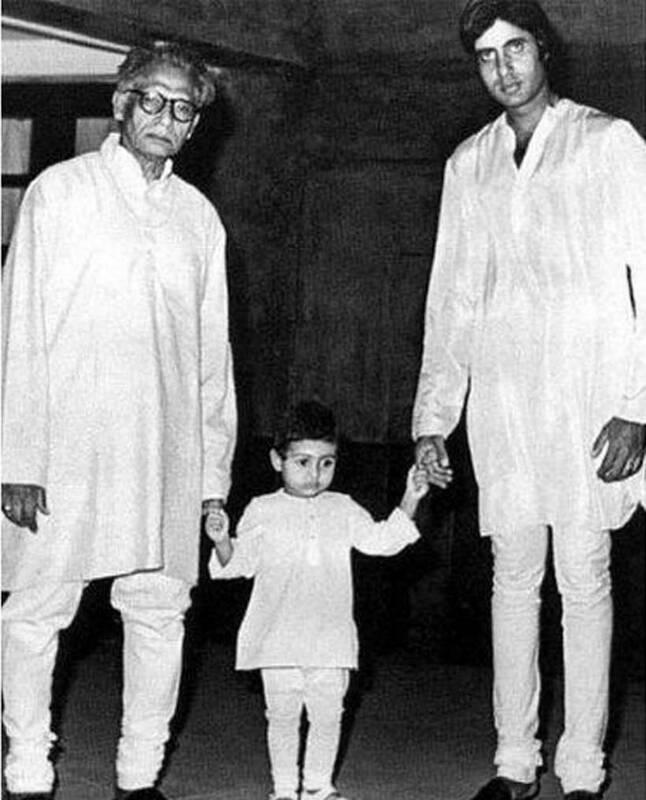 Young Abhishek holding the hands of his grand father Harivash Rai Bachchan and father Amitabh Bachchan. 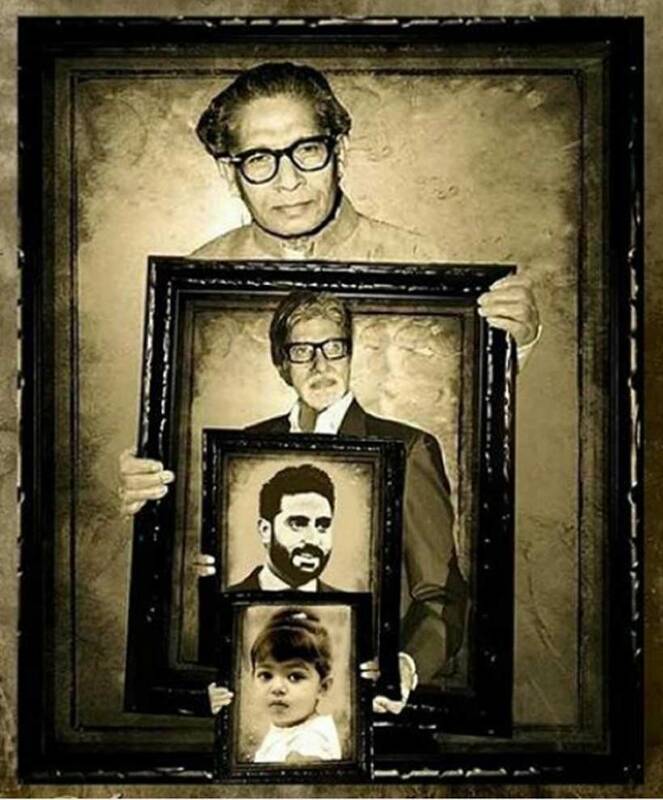 A few days ago Abhishek had shared a portrait of the four Bachchans. 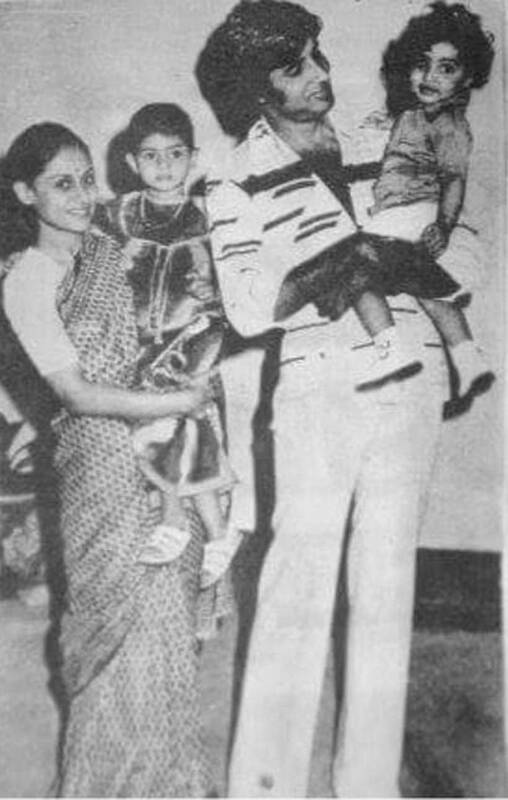 Happy family- Young Abhishek and Shweta in the laps of their famous parents Jaya and Amitabh Bachchan. 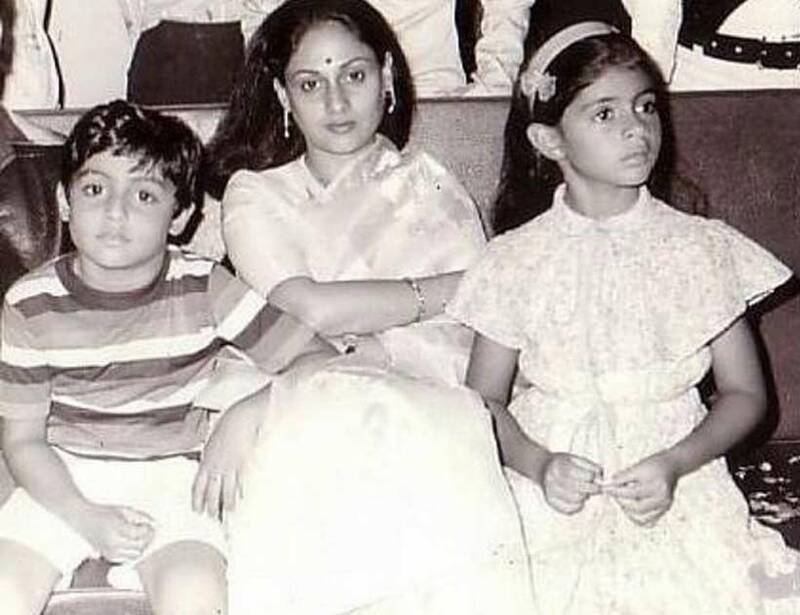 Jaya Bachchan with her children Abhishek and Shweta. 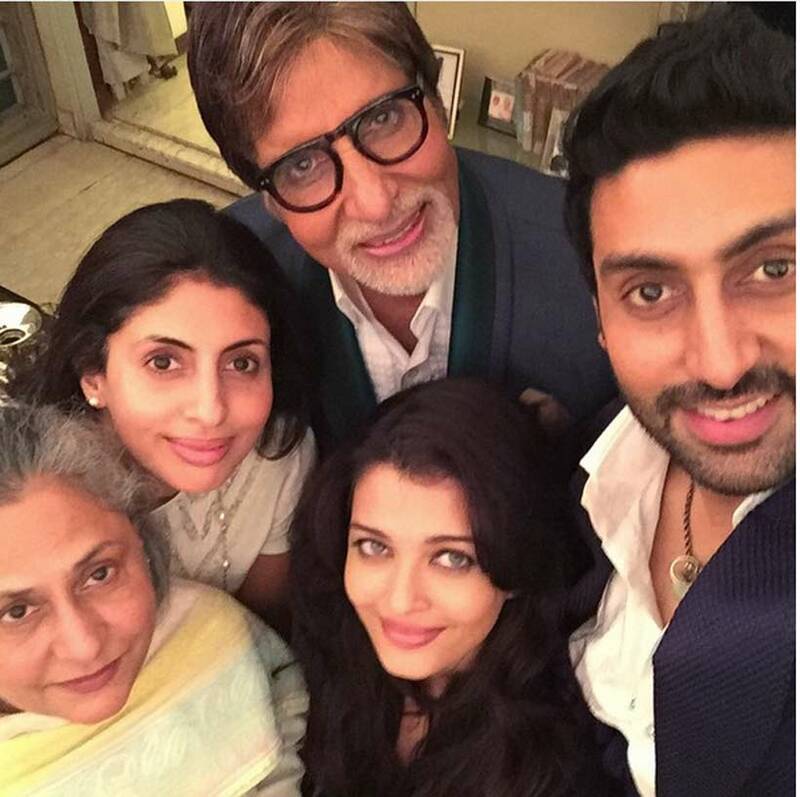 Abhishek's selfie with wife Aishwarya, sister Shwea and parents.